If you are a homeowner, you want your electrical systems to work efficiently. With that being said, electricity presents many hazards whether it involves equipment failure that poses safety concerns for your family or whether it involves potential fire hazards due to poorly installed or damaged wiring and components. Check out our “Keeping Family Safe”™ Checklist below. This Checklist will help you Keep your family safe. Are household smoke detectors installed in each room and are they working correctly? Ask us if they meet NFPA standards. Do GFCI’s work correctly and are they installed to meet today’s code and standards? Does your service equipment show signs of rust or weathering? Do the breakers in the main/sub panels appear to be in working order? Are you exposing your family to a fire by having fixtures with uncovered light bulbs in your home/closets? Are you currently experiencing problems with overloaded circuits constantly tripping (nuisance tripping)? Are there any broken switches or receptacles that may pose a potential fire hazard or electrical code violation? Would you like to add the safety and convenience of hands-free switches in your kitchen or laundry area? 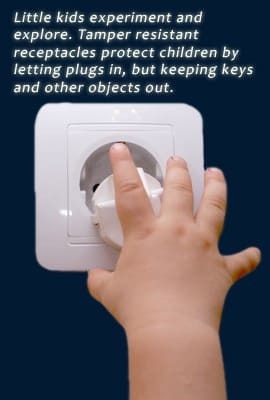 Are your family’s electrical receptacles tamper-resistant in order to enhance child safety? In the event of a storm or power surge are your home’s electronic devices protected by surge protection? Is there sufficient lighting in key areas of your home for safe working such as in the garage, workshop, and kitchen?